I am continually marveled by Roxana Villa. She is a prolific and highly gifted natural perfumer whose work I greatly admire and her dedication to nurturing the native flora and fauna of her home in Southern California is unflagging and commendable. She has created perfumes inspired by local plants such as the native rose of California, lavender from Ojai Valley, and the California Coastal Live Oak. Additionally, a portion of the proceeds from the sale of several of Roxana’s perfumes are donated to organizations like the California Chaparral Institute and the Ojai Lavender Festival. As if Roxana didn’t have enough on her activist-perfumer’s plate, over the past year she has become an organic beekeeper. Her efforts are part of a movement to help reverse colony collapse disorder and ultimately save the honeybee (and ourselves) from destruction. Her hard work also gives her the opportunity to savor her bees’ honey. Roxana sent along a tiny pot of this glistening elixir which tasted heavenly as it mingled with melted butter atop my morning toast. Along with this culinary treat, her bees have given rise to Roxana’s newest olfactory creation, To Bee, a 100% natural perfume that radiates the essence of honey. To Bee is available in solid and liquid form, and both are composed of several complex accords, botanical notes, as well as tinctures from beeswax sourced from Roxana’s hive, local hives, and feral rescue hives. The result is a mosaic of scents that swirl together harmoniously which then ultimately distill to a crystalline honey drydown. Amber and musk accords anchor To Bee with a resinous sweetness and a vegetal musk as tonka, woods, vanilla, ambrette, and hay offer their enticing aromas. It sets a tone of warmth that gives To Bee a glow in which the honey can bask. But it’s Roxana’s intricate leather accord that makes To Bee quite unique and animalic as it’s made up of choya (smoked sea shells), africa stone and oud- along with nearly fifty other essences! This leathery bounty of notes boosts the muskiness of Too Bee and gives its sweet amber accord a sultry sexiness. Clearly, Too Bee is not a one dimensional honey scent. It is sophisticated, alluring, and a pleasure to wear. 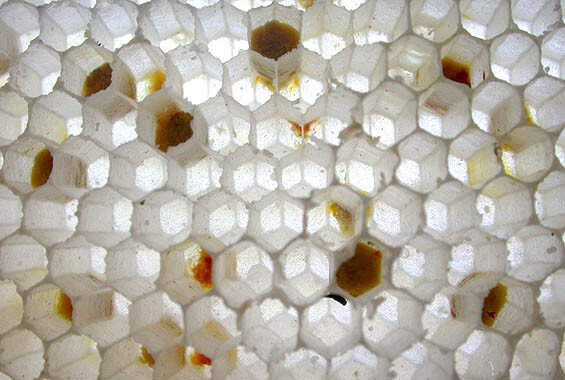 In its final hours on the skin, Too Bee dries down to a pure honeyed experience, like the scent of melting beeswax which I find utterly intoxicating. A slightly floral component is more noticeable in this stage as jasmine and mimosa seem to quietly declare themselves. A little musk lingers as well, more so in the solid form, but it’s the honey from hardworking bees that makes the drydown, as well as To Bee in its entirety, so very alluring. Please leave a comment if you would like to be entered in a drawing for a sample pot of Roxana’s To Bee. US entries only please. Drawing closed, will announce winner soon! A sampler of To Bee is available at Roxana’s etsy site. Beautiful engraved lockets filled with To Bee are also available as are 5gm solid pots and a 7gm liquid flacon. A spray version is coming, and that’s what I’ll be holing out for! Disclosure: Samples were sent to me for consideration by Roxana Illuminated Perfume. The opinions in this review are my own. I was not financially compensated for this review or any other. Wow. I really love your review. Each time I read something about To Bee, I want it more and more. I’ll be ordering the sample set next week, so no need to enter me in the draw, I just wanted to stop by and show my support for bees, Roxana and for Scent Hive! You had me at the description of your toast, but as soon as I saw the word “animalic” , I was truly sold. This fragrance sounds incredible and I would love to try it! Is Roxana selling the actual honey as well? Ha! Toast is so good isn’t it? In truth, it was gluten free toasted bread, and soy-free Earth Balance Buttery Spread, but damn that honey made it really really tasty! I asked Roxana that same exact question as I want more of her honey, and was also thinking it would make for terrific gifts. She said it’s a possibility for the future, but entails more land. PS: So glad to see you’re up and running again with your blog! Ha, I actually have a bit of a gluten intolerance despite my love of bread, and I’m lactose intolerant, so that bread and spread sounded right up my alley. Hopefully, Roxana is able to sell the honey eventually. Trish, I am filled with an aura of gratitude at reading this thoughtful and wonderous review. So happy you enjoyed natures sensorium of treats. I hope you feel the gratitude coming right back to you! Recently I has been thinking about finding a perfume with the distinct smell of honey. To be precise, I think about it every day before going to bed. Why? Because I apply a lip balm with a honey note in it, like it every time and want it in my perfume. This could be just what you are pining for Undina! Wow, that sounds lovely – just like my kind of scent. Have recently ordered a bunch of samples from Roxana (haven’t arrived yet) and would love to try the Bee! I would love to be entered in the draw, please. I’ve been reading about this one, since she began it. Roxana’s fragrances are enjoyable, especially the solids. Have you checked out her blog entries regarding To Bee? So very interesting and beautiful! 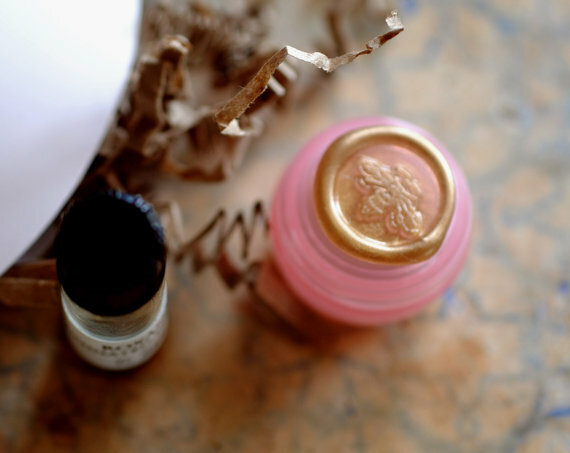 I have been meaning to sample Roxana’s natural perfumes for forever (since you first introduced them to me)! Would love to be entered! You definitely need to try her perfumes Jordan, you would love them! I have tried all Roxana’s scents, and I have liked them all, and loved several. Please enter me in the draw! It surprises me that so few women know about the value of the honey facial! You just spread a thin layer of very good organic honey all over your face, wait about 15 minutes and wash it off with hot water and a lite soap and voila! Deeply clean and very soft skin! Please enter me in the draw for To Bee. I love all things made of honey. What a great review of To Bee! I was lucky enough to get a sample of it in a recent order from Roxana, and I agree with you, the scent is very special: warm and gorgeous and complex. But I didn’t realize her leather accord included choya–explains all the more why I love it! Thanks for pointing that out, and for all your helpful and insightful reviews. (I read your posts all the time, tho rarely comment.) And thanks to Roxana for her amazing work–I adore her perfumes and marvel always at how they manage to be inviting and charming as well as intriguing and multi-layered. No need to enter me in the draw, obviously, as I’ve already tried To Bee–but thanks again for the review! Sam, thank you so much for your kind comment! I am so glad you have been enjoying Scent Hive and I hope to read more of your comments! I appreciate what you have added to the To Bee discussion, and am thrilled you already know it and love it. I’ve been a bee-keeper for 40 years and have been hoping for a perfume that smells like the hive for just exactly that long. You are the answer to my dreams! Please enter me into the draw. Yay! And thank you for your work as a beekeeper! 40 years of experience with these amazing creatures, how wonderful. This just sounds wonderful. I love honey scents, and this one sounds a step above the rest. I already love everything I’ve sampled of Roxana’s so I have no doubt this one will be a winner as well. I’d love to win a sample! T, nice review! hope all is well and you are having a great summer! Please enter me in! Judging by the notes (choya, african stone, oud, honey), I think I’ll love this! Please enter me in the draw, T! Sure will Lavanya, thanks for stopping by! These notes sound fantastic, I can’t wait to try her latest! Roxana is my favorite natural perfumer and I agree that she’s extremely talented. Please enter me in the draw. So glad to hear that Melanie, good luck! I just received samples of both the solid and liquid forms of To Bee in the mail today! Wow. Wow. Wow. I love the mix of the leather accord with the coumarin/beeswax sweetness. And it is just the right amount spicy, too. I thought cimbalom would always be my favorite of Roxana’s perfumes, but I don’t know, this one is spectacular–especially the liquid version, at least on my skin. The leather accord mixed with the honey is fabulous isn’t it? I can’t get enough!! A lovely review of To Bee! I just today received the beautiful antique compact from Roxana filled with her sublime solid, “Vera”. Oh how I’d love to try her newest creation. Thanks for the chance! Vera is gorgeous, I adore it! Those antique lockets look so beautiful on Roxana’s easy site, I think I need one! I am most intrigued by this – we started keeping bees last year and the smell of the wood frames and the beeswax and the honey is wonderful. To Bee sounds terrific, too! Please enter me in the drawing. Thanks! I need to smell the wood frames myself, sounds like it would make me swoon! You make this sound so inviting. I love honey in my tea. I don’t think I have ever had a honey fragrance. Please enter me in the draw…I want to smell “very alluring”!!!! Can’t blame a girl for wanting to smell alluring, that’s for sure! 😉 Will enter you in the draw, good luck! Oh, this sounds lovely. Please enter me in the draw! I found both forms to have amazing longevity. Did you sense a bit more musk in the solid? Just curious what (if any) differences people have noted in the two.